Today was and is a rainy day, cool, like fall is back and spring passing away, nevertheless we were not scare by the weather men nor the dark clouds and headed out to meet our king Arthur and magical Merlin in Brocéliande , the region of fairy tales. Since a boy, I always heard the wonderful stories of the magician Merlin, the Vivianne, and king Arthur and the round table. I have passed by the area several times on quick runs, and finally decided to visit this part of Brittany with the family. We headed out early on road N24 to link up at past Ploërmel with the road D724, direction Campénéac then the road D40 direction Paimpont, to go back and around the region from there. The first town we stop was Campénéac, founded from Roman times, and birthplace of a great religious leader and movement that of Armélie Nicolas or the Bonne Armélie. Her skull head is kept at the town’s Church and the body at the Cathédrale de Vannes. You have nearby the tombs of the giants and the abbey of la joie de Notre Dame . http://www.abbaye-lajoie-nd.com/index.php?option=com_content&view=section&id=1&Itemid=2 . As for the tombeau des géants, they are the Tomb, measuring nearly 4 m long and 1 m wide and 1 m in height. This tomb was built from 3 menhirs that stood in this place by 2200 BC. Today are visible walls and 3 menhir lying at 8 m. The Tomb as seen today dates from the Bronze age (about 1500 BC). Its name is probably due to its shape and its dimensions. There are marked by a panel just out of Campénéac from the road D312 to the D40. We decided to walk around a bit in the town and took an aim at the Church where a woooden carved devil holds the table of the priest in the altar, but it was closed. Church of the Trinity of the most Holy Virgin or église de la Nativité de la Très Sainte-Vierge. We continue on to Paimpont, we heard a lot of good about the town, but the abbey was Under renovation,and it is heavily tourist invaded, not really my cup of tea ,living here. Again seen from the outside, the abbey of Paimpont is an impressive building. There is some treasury visits in the summer months, but not for me. Built in the 13C, on the site of a Priory founded in 645 by Lacy, King of Dumnonia. Benedictine monastery originally, it was the 13C inhabited by canons until the Revolution. Medieval Gothic style (walls, openings, the baptistery and the chapel of St-Sacrement, the vault), the Abbey presents interior decoration (Chair, statue, altars and altarpieces) characteristic of the baroque style of the 17C. The sacristy contains the Treasury of the Abbey Church composed of a beautiful Christ in ivory (17C), a reliquary (15C) offered by the Duchess Margaret of Brittany, mother of Anne of Brittany, which would contain a radius of Saint Luke, a statue in polychrome wood (15C). You can contact the tourist office in above link for Brocéaliande or call +33 (0) 2 99 07 83 20. We continue passing by Beignon, and seeing the nice Church Saint Pierre, it is in the form of a Latin cross from ealry the 16C. You can admire beautiful classified stained-glass windows dating from the 16C depicting the tree of Jesse and the life of St – Pierre and its pits carved frame. The North Gate is dated 1268 and an episcopal crest. We arrive at the wonderful town of Plélan le Grand, where we immediately sighted the Church. 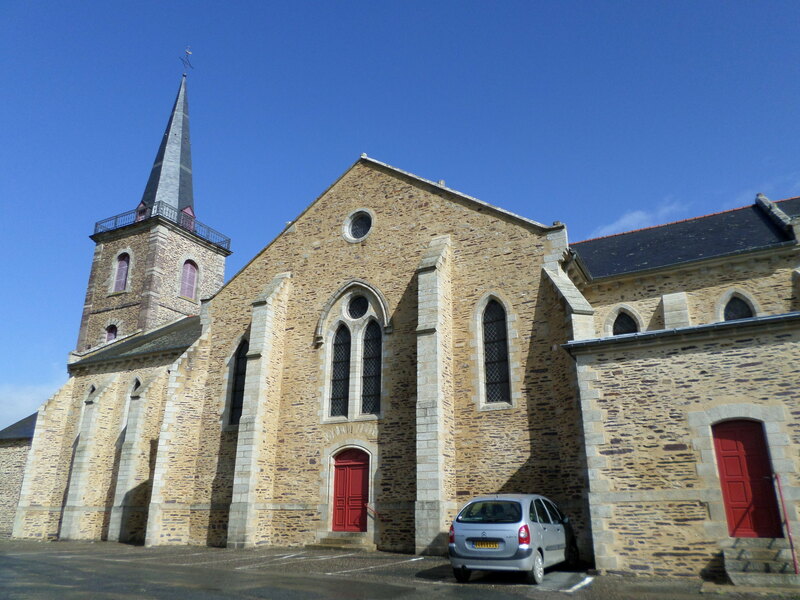 The St. Peter’s church or église St Pierre was built from 1850 in a place of a church from the 13C which survives that of chapel of Sainte-Anne . North side, a tower dating from 1620 plays the role of Bell Tower. It has a wonderful calvary on the side, beautifully done. We walked this town up and down very lively , very friendly folks, we purchase our baguette for home here at Michel Bellier boulangerie, pâtisserie on 53 Avenue de la Libération, the main road of the town. And the highlight of the trip for us, was lunch time at Plélan le Grand. We heard of all the famous ones at the tourist office, but we went to a people place, down to earth and friendly folks , full, but so friendly, the owners do the the cooking and serving and it shows. Les Boucaniers or the Buccaneers restaurant not far from the Church on the main street of ave de la libération, and rue Nationale ,same road. Here we got the big table by the bar,as the back dining room was full. We were behind a door with a picture of Marilyn Monroe, figure it was the toilet or restroom but it was the stock room so all the good stuff was right behind us! The lady owner server was laughting with us all the way. They serve several servings of bread and butter, plenty of water, and good Grimbergen blonde beers. We had the house menu du jour, for an excellent 10,70€ per person. You have entrée buffet with cold cuts, terrines of paté campagne and mousse de salmon, hard boiled eggs, pasta with shurimi shrimps, potato salad, just to start, then the main dish was hashi parmentier with pork and sausage meats, and bottom cut of steaks, with fries and salads greens, and for desserts, fondant de chocolat, and sorbet framboise and various fruits shunks; the beers we double it, so the total bill came to 16€ per person, a great bargain and sure to remember this place, take a look at the pictures. no webpage and telephone is at +33 (0) 2 99 61 87 90 .
and we came back to buy my wines at Nicolas , Vannes,and do our groceries at E Leclerc in Auray. voilà, just in one day of work. Now tomorrow rest. Enjoy it, and have a great end of weekend.